April 05, 2019 - "White Papers"
Compressed air safety is a concern for all. Compressed air is commonly referred to as the “fourth utility” because it is very common as a resource within manufacturing, mining and processing environments. Employees or contractors in every industrial company or setting are exposed to compressed air’s effects regularly and it should be handled with responsibility and care. The primary dangers from compressed air come from high pressure and noise exposure. Personnel being exposed to compressed air which exits an open line or non-safety nozzle at a higher pressure than 30 PSI risk the air entering the bloodstream and causing air embolism, a serious health risk. Improper use of compressed air commonly exceeds OSHA’s noise exposure standards and causes noise induced hearing loss (NIHL). The CDC reports NIHL is one of the most common occupational diseases and the second most self-reported occupational illness or injury. And because compressed air can be loud and result in hearing loss when it is used through poor nozzles, open tubes and pipe, or home-made blowoffs, their noise exposure standard is important. Limiting pressure and noise is effectively done by using products which are purposefully designed to meet these strict OSHA safety standards. 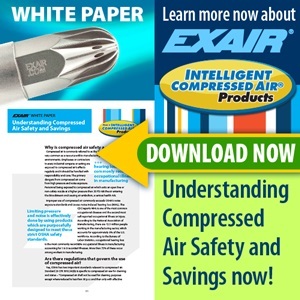 EXAIR's White Paper "Understanding Compressed Air Safety and Savings" is designed to help readers learn more about compressed air, how to be sure you are OSHA compliant and how EXAIR’s Intelligent Compressed Air products can help.